This book addresses women’s rights to work and motherhood in Libya from a legal and international human rights perspective. 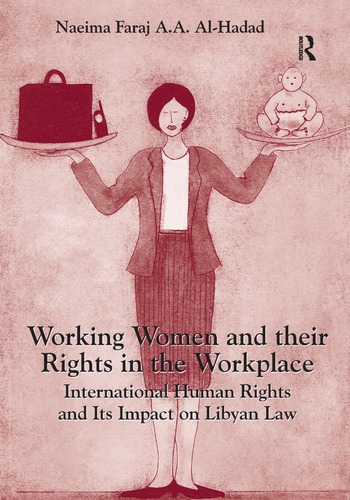 In an attempt to solve the problem posed by the perception that there is an unsolvable conflict between the right of women to work and their right to motherhood, the author considers how these two sets of rights, as protected under international human rights law, can and should be recognised and promoted within the Libyan legal system. Including first-hand accounts of experiences of Libyan women, the study voices their struggle for their rights as guaranteed by domestic law, international conventions and Islam. Providing a rare insight into a region striving to find its new identity, the author assesses the adequacy of existing Libyan laws and, where warranted, offers proposals for legislative amendments to Libyan policy makers and its new Parliament at such a crucial time in the nation’s history. Naeima Faraj A.A. Al-Hadad, is Assistant Professor in International Human Rights Law in the Department of Public Law, College of Law, University of Bahrain.